This week, Faults in the Vaults returns as we head into the courtroom for a double feature of high brow, high stakes legal dramas. 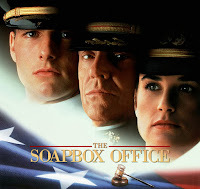 We learn to handle the truth and court martial A Few Good Men (1992) in order to carve out a large settlement for Francis Ford Coppola's The Rainmaker (1997). The Mailbag continues a Steven King discussion and tries to gauge excitement for Star Wars: The Last Jedi. Josh goes Slipping Through the Tracks to make a case for the great Elmer Bernstein's atmospheric and tension-laced score for Martin Scorsese's remake of Cape Fear (1991). Another edition of Recycled Cinema takes a look back at Sidney Lumet's courtroom classic, 12 Angry Men (1957) and William Friendkin's outstanding 1997 remake led by Jack Lemmon and a who's who of top acting talent. Also in this episode, a Parksploitation-extravaganza at the New Beverly, Josh's short, animated film Other Fish getting into TromaDance, clashes with Johnny Law, and useful legal tips with a little help from the great products at Raleigh Soapery! The New Angle On Watch G Rated Movies Online Free Just Released. Learn about watchseriesunblocked on watchseriesunblocked.org.